Apang Tertön (Tib. ཨ་པཾ་གཏེར་སྟོན་, Wyl. a paM gter ston) aka Apang Terchen, Pawo Chöying Dorje (དཔའ་བོ་ཆོས་དབྱིངས་རྡོ་རྗེ་, dpa' bo chos dbyings rdo rje), Lhachen Tobgyal, Orgyen Trinlé Lingpa (ཨོ་རྒྱན་ཕྲིན་ལས་གླིང་པ་, o rgyan phrin las gling pa) or Orgyen Drodul Lingpa (1895-1945) — was a great tertön whose body could pass through solid objects and who discovered many terma teachings, and and one of Dudjom Lingpa's miraculously conceived sons. According to oral tradition, Apang Tertön’s conception was miraculous. Through the concentration of Dudjom Lingpa’s wisdom mind, the child was conceived from afar in his mother’s womb, who happened to be a nun with pure vows. 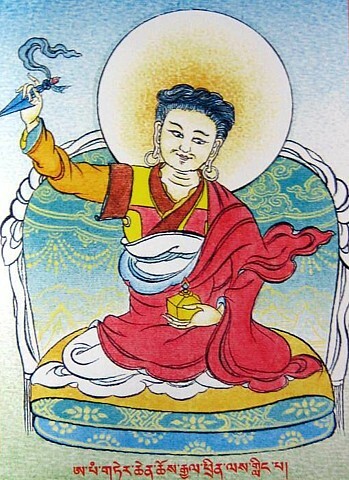 Apang Tertön was considered to be the reincarnation of Rigdzin Gödem and of Zhichen Tulku Rinpoche. At age eight, Apang Tertön was taken to Katok Monastery and enthroned as the reincarnation of Zhichen Tulku Rinpoche. Apang Tertön came from Golok and his practices spread throughout Tibet. The main holder of his teachings was his daughter Tare Lhamo (1938-2003), as well as his three sons; the custodian of his termas was Changchub Dorje. He was also a root guru of Dodrupchen Rinpoche. Apang Tertön’s death was as extraordinary as his conception. Announcing his intention to help the Sakya lineage, he passed away deliberately and reincarnated as Sakya Trizin the current head of the Sakya tradition. Nyoshul Khenpo, A Marvelous Garland of Rare Gems: Biographies of Masters of Awareness in the Dzogchen Lineage, Padma Publications, 2005, pages 488-491. This page was last edited on 22 June 2018, at 21:26.